This is an uneven film that provokes strongly mixed feelings with the quality register probably ending up in positive territory. 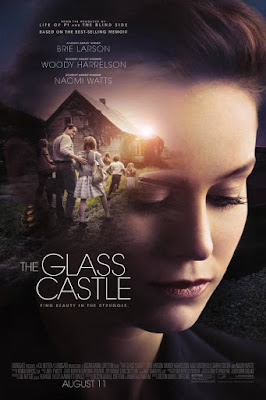 For most of its two-hour running time, The Glass Castle is an absorbing, powerfully acted drama about a dysfunctional American family as seen through the eyes of the father’s favourite child. At times, no punches are pulled, almost literally, but at others, particularly in a contrived “happy” ending in which the film opts for sentimental closure, we feel manipulated by the Hollywood machine. The movie is adapted by director Destin Daniel Cretton and co-writer Andrew Lanham from the best-selling memoir of magazine journalist Jeannette Walls. It stars the Oscar-winning actress Brie Larson who gives an understated performance as the adult Jeannette in present time, using extended flashbacks to take us back to her childhood. Jeannette’s parents, Max (Woody Harrelson) and Rose Mary (Naomi Watts) are, in their different ways, parents from hell. Max, full of progressive talk and ambitious ideas, but almost entirely unable to follow through on his promises, is an obnoxious drunk who can’t hold down a job, shifting his family of three girls and a boy from town to town and shanty home to shanty home, just ahead of the bill-collectors. While he’s hitting the bottle, Max is an abusive menace to his family; on the rare occasions he’s sober he shows a more loving side and a capacity for becoming a far more impressive person. During these moments the film conveys a certain charm as an offbeat coming of age story. For her part, Rose Mary is an artist first, a wife second and a mother last. She’s weak, compliant to a fault, unable to stand up to her husband and, more pertinently, to leave him in the interests of her children. Eventually, as time passes, the family crisis boils over and the children begin to plot their escape from their family jail. The present-day action largely focuses on Jeannette, a gossip columnist for a New York magazine, preparing for her marriage to a financial analyst. It is apparent that her virtually homeless father still has the power to unsettle her. The cast is a particularly strong one and Harrelson is impressive as the abusive father who reserves his strongest feelings for his oldest daughter. While we discover that his behaviour is not without its causes, his complete inability to address his issues is lamentable in the light of what he does to his family. It is against this background that the film’s ending – in which we are encouraged to give Max and Rose Mary a break – is so regrettable. Of the three actresses who play Jeannette, it is Ella Anderson who comes up trumps with a heartbreakingly complex portrayal of a girl who simultaneously adores and fears her daddy.